¨ The Structural Complexity of the system being transformed (C). ¨ The Transformational Volatility of changing the system (V). ¨ How much of the system needs to be changed - its Scope (S). ¨ The reason for the changing the system - the Requirements (R). To complicate matters, Scope is also a function of the Structural Complexity of the “thing” being transformed and the Requirements. For example, a small requirement may cause a large change to the “thing” in question purely because of that “thing’s” structural complexity. Conversely a large requirement may cause a small change to the “thing” in question again purely because of that “thing’s” structural complexity. 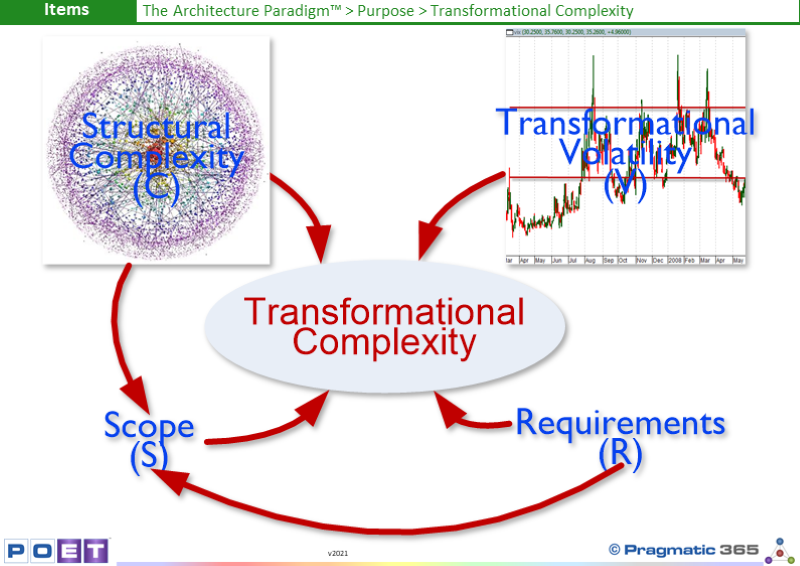 While Transformational Complexity is low, people can deal with it easily, but as Transformational Complexity rises tools and techniques are required to cope. One tool/technique specifically designed to address this is The Architecture Paradigm™. Are you aware of your Enterprise’s Transformational Complexity?